My Sister Sofi | Cycling Shorts. Sofi Arreola is a young successful rider from Mexico (she also happens to be my sister) and she’s aiming for a place to ride for her country at the London Olympic Games in 2012. Sofi has won 6 gold medals in the Jr. PanAm champs, 4th place in the Junior Worlds in Moscow 2009 and she’s finished within the top 10 in almost every Track World Cup she’s competed in. 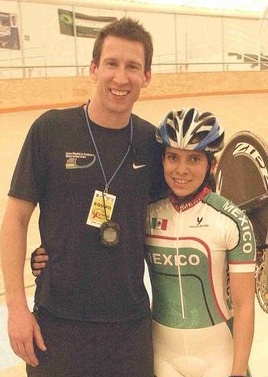 She was invited to the World Cycling Center in Switzerland for the 2009-2010 track season and that changed her life. Her results as a Jr. were really good but it wasn’t until she met her new coach Andy Sparks that she started to look at cycling in a different way. Not everything has been easy for her, she’s had to fight for everything… including her own life. Sofi was a premature baby and she almost didn’t survive. The doctors told dad that he should be prepared for the worst because it was very possible that she wouldn’t survive the night, but she fought and she won that battle. She was getting 15% less oxygen than other babies for one and a half months and she was so tiny. We had to take lots of care with her because she was always getting sick (I have to admit… I was SUPER jealous because she was getting all the attention from my parents). She used to be allergic to everything so she had to go to the hospital once a month to get 30 injections in her tiny little arms. I could see in her face she was in so much pain but she never cried or complained about it; 3 years old and she was so tough! She wasn’t 100% healthy but my little sister was never weak. She has been giving me life lessons since the minute she was born. 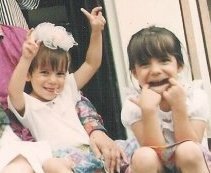 Our younger sister Chely and I are really hyper so my parents introduced us to sports at a very young age. Chely is 2 years younger than Sofia but she was just as big as her and beating her in every sport they tried! I bet she can’t say that anymore though… haha! When I started cycling both my sisters were doing speed skating and they were really having fun with the sport but after one year they took part in a local bike race and they instantly fell in love with cycling, just as I did. Sofi did the State Championships two weeks after that but she didn’t qualify for the Nationals so she made it her personal goal to win it the following year, she worked harder than anyone else, never missed a single practice and she was really serious about eating well and taking her recovery to a whole new level. It was impressive to see a 13 year old girl behave like that. The next year she won everything in the State Championships and got 2 silver medals in the Nationals, since then she’s won almost every competition she’s entered in Mexico. The first time my sister ever rode on the track she won the Scratch Race in the elite category when she was only 14 beating Nancy Contreras (former 500m World Champ) and yeees… she beat me as well but let’s forget about that part! She’s had many good results in her short career but also had her ups and downs. In her first Jr. World Champs she crashed in her opening event and was forced to use a wheelchair because she couldn’t walk, but even that didn’t stop her from doing the road race and TT. She also crashed in the Central American Games last year in Puerto Rico. She was knocked out but the first thing Sofi said when she gained consciousness was “where’s my bike? !” she finished the race concussed and went straight to the hospital not knowing where she was. All her efforts that day gained her a bronze medal for Mexico, a bronze with a good taste of gold. 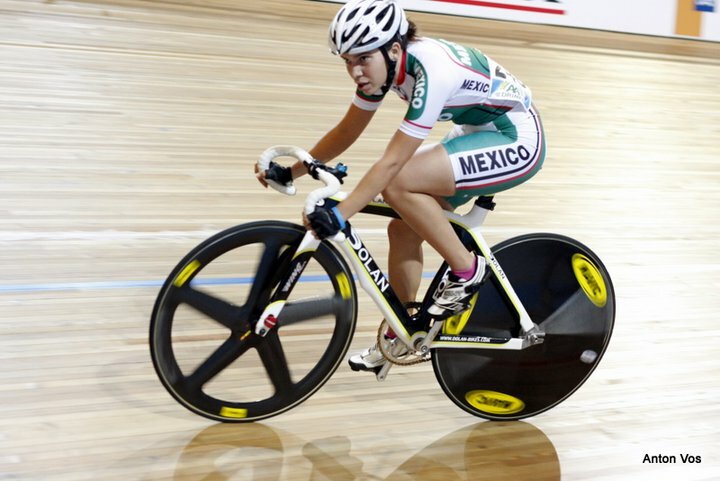 I’ve seen her do an Omnium going from the ambulance to the track and then back to the ambulance again because she was really sick and even then winning 4 out of 6 events (it was an important race because it would decide who was going to the track world cups to represent Mexico). The Olympic dream has been in her head since she was a little kid and it’s that determination and desire that leads her to keep fighting. Even with those chaotic races she’s had good results on her way to London, she finished 2nd in the elite PanAms [Pan-American’s] last year and 4th in the Scratch Race at Manchester’s World Cup, putting her in 2nd place in the world rankings but eventually she finished 4th at the end of the track season. Of course Sofi and I have the support of our whole family. 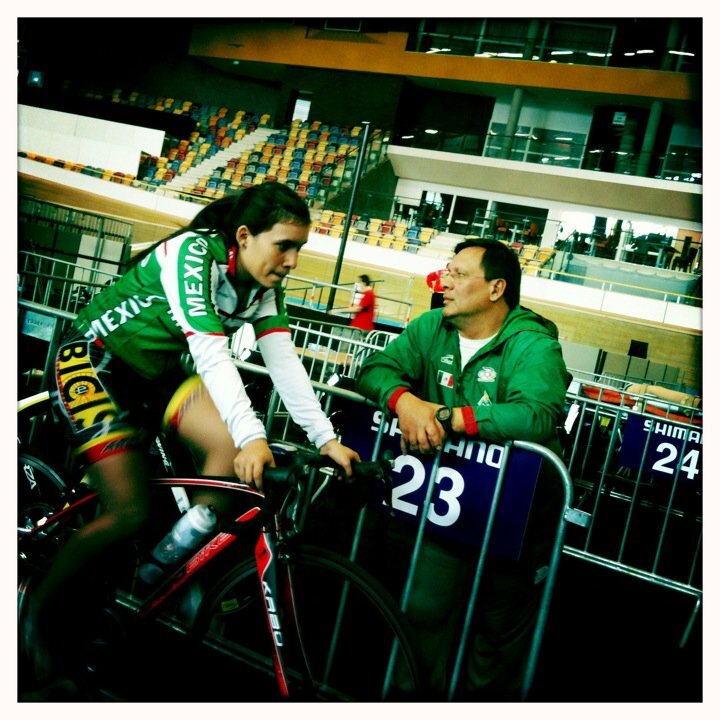 My dad Rolando goes to almost every World Cup with her and when we’re in Mexico he follows us both to every single ride providing all the support while training; my mum Nancy is the one who makes sure that Sofi has everything she needs. 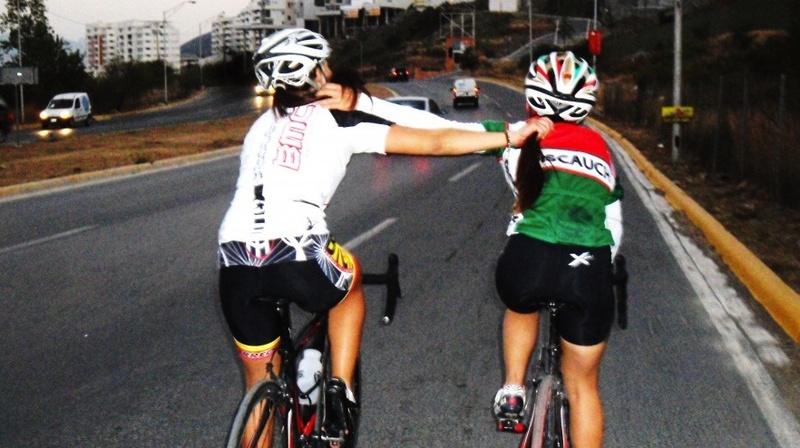 Mum calls the FMC [Federación Mexicana de Ciclismo] almost every day, books her tickets to World Cups and she also makes sure that she has all the right equipment to train and race. Chely and myself are her biggest supporters! But I think the main thing that has made the biggest impact on her career is training with Andy Sparks, she was training with him when she was in Switzerland and now she’s followed him to Mallorca where they are now both based. Andy is an amazing coach and they get along really well. She has a lot of respect for him and follows everything he says 100%. Since she’s been training with him we’ve seen her gain more confidence in her skills and has a better attitude while racing. Andy gives her the right motivation and the perfect training to be at her best in every competition. 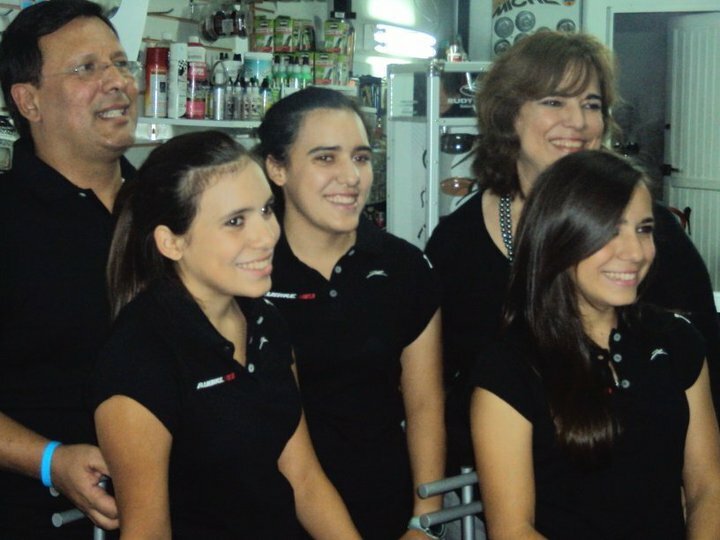 Sofi knows that nothing is impossible if you work hard for it and you give your best at all times. The fact that she gets to train with Sarah Hammer is also a major boost for her, Sarah is her role model and inspires Sofi to become better every day. Sarah and Andy have been an amazing support for her when she’s away from home, even when she’s missing family, home and friends she’s surrounded by great people in an amazing environment and we know she’s happy even though we all miss her. She had a complicated season last year but has pulled herself together and focused on doing things right and hopefully she’ll qualify for the London Olympics and achieve a good result. She’s taking it a step at a time, the next track season will be crucial for Sofi, as it will be for many other riders across the world, in order to qualify for London she needs to get good results in the 4 World Cups and the World Championships in Australia. It’s going to be a fun season; I am excited to see how it goes! Thank you very much for reading and I’ll be giving you more updates about the World Cups and who has a chance of getting to ride in London 2012 via my articles here at Cycling Shorts!